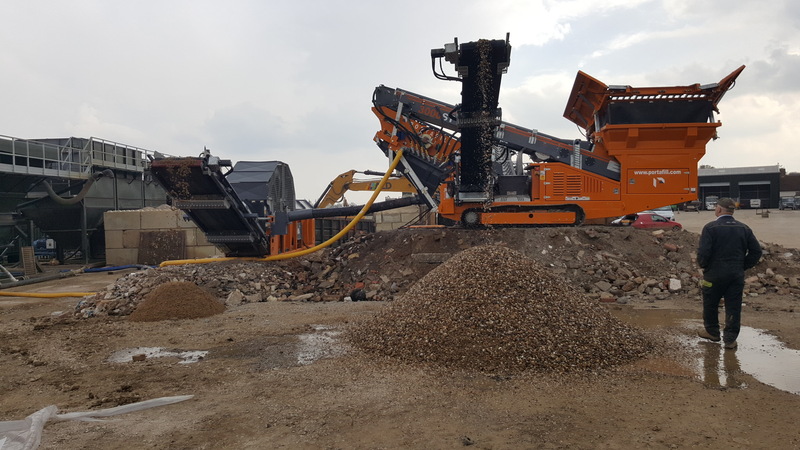 Anglian Land Drainage, based near Chelmsford, Essex have invested in a new Portafill 3000 Washing Plant from Riverside Machinery Ltd. The plant consists of a Portafill 3000 Rinser, Portafill DW80 Sand Plant, Sand Stockpiler and Fresh Water Pump. The plant is being put to use to screen a mixture of materials including recycled material, virgin material and reed bed material. Depending on the mesh fitted to the rinser, a number of sizes are being produced. These include-5mm, 10mm, 20mm and 40mm. The plant can produce 2 grades of stone and 1 grade of sand. Power is supplied by diesel driven engine in the Portafill 3000 Rinser which in turn supplies hydraulic power to the Portafill DW80 Sand Plant.